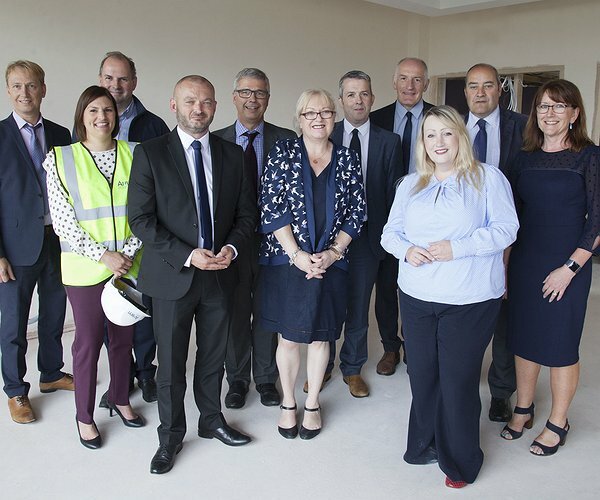 She met Flintshire County Council members and officers as well as representatives from Clwyd Alyn Housing Association at the Flintshire Connects office before heading over to the new extra care scheme, Llys Raddington. Llys Raddington is the third facility of its kind to be built in Flintshire and provides 73 self-contained one and two bedroom apartments together with a wide range of communal facilities, and is managed by Clwyd Alyn Housing Association in partnership with Flintshire County Council. The building contractor for this project is Anwyl Construction. The Minister then had the opportunity to visit the Walks in Flint, the first site to be re-developed as part of Flintshire County Council's Strategic Housing and Regeneration Programme (SHARP) where a combination of 92 new council and affordable homes have been built by programme partner Wates Residential North, the first to be built in Wales in a generation. "We have committed to building 20,000 affordable homes during this Assembly term, and it's great to see how Flintshire County Council are playing their part. "Good quality homes in developments like the Walks are the bedrock of good communities, and help individuals and families to flourish." "I am delighted that the Minister was able to visit the Walks in Flint. We are immensely proud of the work that we have started and which continues in many other areas of the County, which will bring the total number of new properties to nearly 300 so far. As the demand for social and affordable housing continues to grow, we must maintain the momentum in our ambitious plans to address that demand. "These new sites are at the heart of our local communities and will provide further high quality housing, help sustain those communities and create employment opportunities." "It was great to welcome the Minister to view the new Llys Raddington extra care scheme and we're pleased that she also took time out earlier in the day to call in to the Old Court House CafÃ© and Community Heritage Hub in Flint where she met with the ODEL Involve Team to learn more about the important advice and support service they provide in the County." During the course of her visit the Minister met with the Leader of the Council, Cllr Aaron Shotton and Council officers to discuss housing issues in the County including NEW Homes Development Strategy, increasing pressure on the homeless service and ways to prevent rough sleeping.